Celebrity parents are just like us, they say, except when it comes to naming their babies. Maybe it’s that whole thing about being in the spotlight that puts the pressure on celebs to come up with some unique names for their kids. Also that they are creative by nature, so often give pretty creative names to their kids. And also have the power to turn unusual or outmoded baby names into contemporary hits. Our Bollywood celebrity parents have given some cool names to their progeny. Aamir Khan and Kiran Rao : Aamir and Kiran, who went the IVF-surrogacy way to have a child, named their son Azad Rao Khan. He has been named after Aamir’s great grand-uncle, Maulana Azad, who was a famous freedom fighter. Azad, of course, means ‘free or liberated’. Shilpa Shetty and Raj Kundra : Shilpa and Raj wanted to give a symbolic name to their little one, They named him Viaan, which means ‘full of life and energy’. 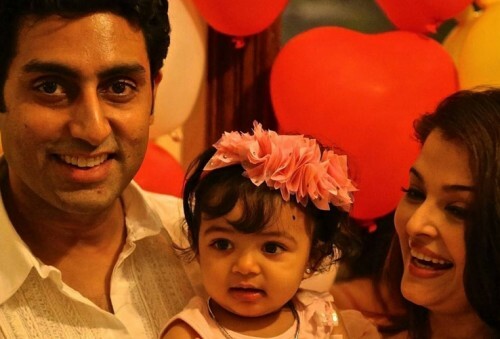 Aishwarya Rai and Abhishek Bachchan : Aishwarya and Abhishek, decided to go with a Sanskrit name for their daughter, Aaradhya. It means ‘to be worshipped’ or ‘someone who is worth worshipping’ in Sanskrit. 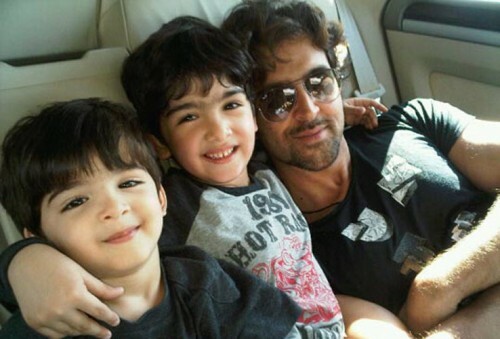 Hrithik Roshan and Sussanne : Sussanne and Hrithik chose two unique Indian names for their boys. Hridhaan means a person with a ‘big heart’ whereas Hrehaan, which is a variation of the Arabic word Rehan, means ‘God’s chosen one’. Rani Mukerji and Aditya Chopra : Rani and Aditya named their daughter Adira, which has parts of both of their names, i.e., Adi and Ra. Kajol and Ajay Devgan : Kajol and Ajay were inspired by Greece while naming their first child, Nysa. It means a ‘new beginning’ or ‘ambition’. Their second child was named Yug, which means ‘an era’ in Hindi. Imran Khan and Avantika Malik : Imran and Avantika, chose a beautiful Swahili name for their daughter, Imara. It means ‘strong and resolute’. The couple has also added both their surnames to their daughter’s name, Imara Malik Khan. Twinkle Khanna and Akshay Kumar : Akshay and Twinkle gave Indian names to their two children. Aarav means ‘in high regard of’ whereas Nitara means ‘having deep roots’. Malaika Arora Khan and Arbaaz Khan : Malaika and Arbaaz chose an Arabic name for their son, Arhaan. 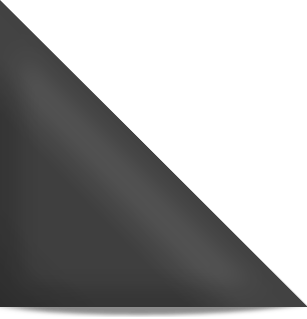 The name means ‘the ruler’. Madhuri Dixit and Dr Sriram Nene : Madhuri and Sriram chose Irish names for their boys. Raayan means ‘gates of paradise/heaven’ in Arabic, and means ‘little prince’ in Sanskrit, and ‘graceful’ in Jewish. Aarin means ‘mountain strength’. Manyata and Sanjay Dutt : Manyata and Sanjay took inspiration from Persian and Hebrew to name their twins. Shahraan is derived from Shah (royal), and raan (knight), which means royal knight or warrior. And, his daughter Iqra’s name means ‘to educate’ in Hebrew. 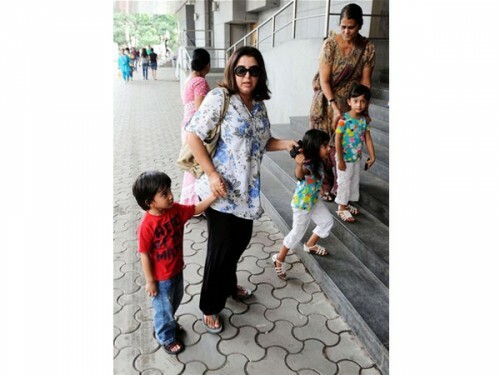 Farah Khan and Shirish Kunder : Farah, who gave birth to triplets back in 2008, named her children- Anya, Diva and Czar. Anya means grace in Russian and infinite in Sanskrit; Diva, means divine in Latin and Czar, is the Latin word for an emperor. Raveena Tandon and Anil Thadani : First names of Raveena and Anil’s kids, begins with the letter R, just like their celebrity mother. Their daughter’s name is Rasha which means ‘the first drops of rain’. And, their son’s name is Ranbir which means ‘brave warrior’. Farhan Akhtar and Adhuna : Farhan and Adhuna named their children, Akira and Shakya. Akira is a Japanese name that means ‘bright and intelligent’; this is also the name of Farhan’s favourite director, Akira Kurusawa. Shakya means a ‘circle of energy’. Arjun Rampal and Mehr Jessia : Arjun and Mehr’s daughters’ name have been inspired by Sanskrit and the Quran. Mahikaa, in Sanskrit means ‘earth’; and Myra, which is taken from the Quran, means ‘swift and light’. Emraan Hashmi and Parveen Shahani : Emraan and Parveen have chosen such a beautiful name for their first child, Ayaan. The name means ‘gift of God’ in Arabic. It also means ‘someone who is religiously inclined’. Karisma Kapoor and Sunjay Kapur : Names of Karisma and Sunjay’s two children have a Latin origin. Samaira means ‘Goddess of Beauty’, the same name also means ‘enchanting’ in Arabic. Their son, Kian’s name means ‘grace of God’. Maria Goretti and Arshad Warsi : Maria and Arshad did not want to choose a name that would denote any religion. That is why; they gave their children alliterative names. Their son is called Zeke Zidaan, which means ‘shooting star’ in Aramic; and their daughter, Zene Zoe, which means ‘beautiful’ in an African language. Konkona Sen Sharma and Ranvir Shorey : Konkona and Ranvir were so inspired by Salman Rushdie’ book, “Haroun and the Sea of Stories” that they chose to keep their son’s name based on the same. His name, Haroon, means ‘hope’ in Sanskrit. It also stands for ‘protector or chief’ in Arabic. Fardeen Khan and Natasha Madhwani : Their daughter’s name is Diani Isabella. Diani is a Portuguese word that means ‘divinity’, and Isabella is Fardeen’s favourite name. The couple chose to give their daughter two names so that she can choose the name she likes the best in the future. Amrita Arora and Shakeel Ladak : Amrita and Shakeel chose two beautiful names for their children. Rayaan means a ‘door to paradise’ and Azaan means ‘powerful’. Celina Jaitley and Peter Haag : Celina and Peter decided to go with an Indian name and a western name for their twin boys. One of them is named Viraaj, which means ‘king’ or the ‘sun’ in Sanskrit, whereas Winston means ‘joy stone’. Madhurima and Sonu Nigam : Sonu Nigam chose Nevaan for his son. It means ‘holy soul’ in Sanskrit. Lara Dutta and Mahesh Bhupathi : Lara and Mahesh chose Saira for their daughter which is a variant of the word ‘Sarah’, which means ‘princess’ in Hebrew, and a ‘bird’ in Arabic. Sushmita Sen : Sushmita Sen, who is a single mother, gave lovely names for her 2 daughters. Renee means ‘to be reborn’ and Alisah is a German name, which means ‘noble’. Ayesha Takia and Farhan Azmi : Ayesha has named her son as Mikail. The name is derived from the name of God’s angel, Michael. Which is your favourite Bollywood Celebrity Baby Names?